The final of the prestigious Lawyers Table Tennis Open (Mfon Usoro Cup) will hold this Saturday at the indoor hall of the National Stadium, Lagos. This year's edition will feature members of the Calabar Bar, who will be making their first appearance in the tourney while their Ibadan counterpart will also be aiming to clinch the trophy. Speaking ahead of the finals, foremost Lawyer, Paul Usoro SAN expressed delight that the tournament has become a rallying point for lawyers from across the country. “I’m quite delighted about this year’s edition of the LTTO tournament. The beautiful thing about this tournament is that it is a platform for lawyers to bond and connect with themselves away from the tense setting of the chambers and courts. I am particularly delighted because this edition is featuring debutants which is an indication of the growing profile of the tourney among Lawyers. I look forward to seeing good sportsmanship on Saturday,” he said. Also speaking on the tourney, Mrs. Mfon Usoro, stressed that that LTTO was inspired by a vision to promote the culture of healthy living among lawyers using sports as the platform. 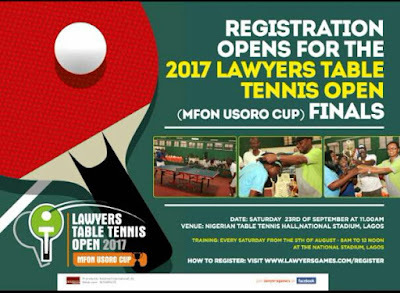 Since it started in 2009, the Lawyers’ Table Tennis Open has grown to become one of the leading annual sporting events amongst lawyers in Nigeria. Participation in the tourney cuts across Nigeria and it enjoys a wide appeal amongst lawyers, the public, the leadership of the Nigerian Bar Association and Judges. More than two hundred lawyers have participated in the tournament since inception, with the numbers expected to increase in the coming years.